Lots of research has been done over the years to figuret out the best recipe for success when it comes to weight loss. Diet alone? Exercise alone? Or a combination of both? It should come as no surprise that the key for weight loss and keep it off is to combine a low-fat, lower-calorie diet with an exercise routine. In a study funded by the National Cancer Institute in 2011, 439 overweight to obese postmenopausal women were assigned to four different groups: exercise only (45 minutes of moderate-vigorous activity five days per week), diet only (1,200–2,000 calories per day, depending on starting weight, and less than 30% of calories from fat), exercise and diet, and no intervention. The yearlong study found that the exercise-only group lost 2.4% of their starting body weight, with the diet-only group losing 8.5% of their weight. However, the group that incorporated both a lower-fat and caloric diet and exercise lost 10.9% of their starting weight, which was an average loss of 19.8 pounds. One other thing that was significant in this study was that the women who lost the most amount of weight and body fat kept a daily food journal, writing down everything they ate and drank. As I said, it shouldn’t come as a surprise that a combination of more balanced eating and movement will lead to the most amount of weight loss. So here are some tips to help make this become a lifestyle for success. Keep a food log. As the study showed, the most successful individuals logged what they ate. Grab a pen and jot it down, or use an app or an online program for tracking. Whichever way works for you, start today! Focus on low fat. Aim for 30% or less of your intake from fat. Fat helps to make food taste more flavorful and helps to keep you fuller longer. However, aim for those good-for-you sources of fat such as nuts, avocado, olive oil, and salmon. Move more. The individuals in the study did 45 minutes of exercise, 5 times per week, but any movement is better than nothing. Start walking, cycling, strength training, stretching, and just moving more each day. If you want to lose weight and are considering starting to decrease your calories or start exercising, hopefully this will help you to decide to do both! If you need more assistance getting started, please contact me at amitchell@nifs.org to set up a personal nutrition coaching session to help meet your goals. It has been found that up to 50% of women in the US are on a diet at any given time. Americans spend more than $60 billion on weight loss products. So with all of these individuals spending money and dieting, why are we still by far the least healthy country in the world? Most of the reasons are due to the extreme and unrealistic expectations that diets force individuals to follow. So why is it so hard to stick to a diet? Trying to change your life and not making it a lifestyle change: Anything that has a start and end date when it comes to food choices doesn’t make it a lifestyle change. If you think of it as “I only have to get through this for the next x amount of time,” this isn’t something that you could or should maintain for a lifetime. Learning how to eat meals and snacks that will nourish your body for the rest of your life leads to success for the long-term. All-or-nothing mentality: Are you on a diet or completely off of one at all times? The key is balance. Allowing yourself to have all foods in moderation at all times has been found to be the most successful “diet” there is. Enjoying foods that you would normally think of as forbidden, but making sure to balance it with the good-for-you everyday foods is key. Instead of cheat meals or days, toss that thinking out and enjoy any food at any time. No patience: Change is tough. Trying to completely overhaul your diet is a recipe for disaster! Instead, have patience by making small changes that will last. One week start trying to incorporate more vegetables into your diet and figure out how you can make that a new habit. Once you have achieved that, move on to another goal such as packing lunch three times per week instead of one. Slow and steady changes have been found to be more effective, and you are more likely to stick to them. Not nourishing your body: When you are walking around hungry, it is really hard to stick to a restrictive diet that has a lot of do’s and don’ts. A balanced diet that incorporates whole grains, lean protein, fruits and veggies, and low-fat dairy will help to make you feel full and satisfied and able to get through the day without the hunger pangs or guilt feelings for overeating. Aim for three food groups at mealtimes and two at snacks to guarantee a satisfying and balanced diet. 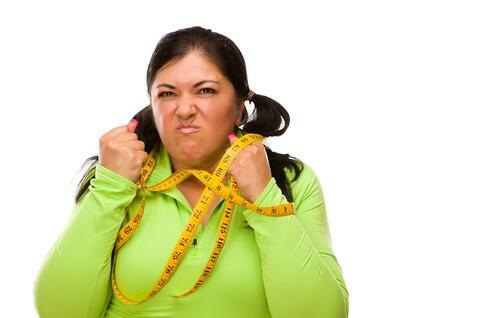 Studies vary, but between 5% and 20% of individuals that lose weight are successful at keeping it off long term. Those that are the most successful report following a balanced diet, self regulation by checking their weight once per week, averaging one hour per day of physical activity, eating breakfast, and maintaining consistent eating patterns across weekdays and weekends. Follow these tips to help add yourself to the list of successful dieters! Looking for an app to help you track your diet? Download our quick read for Angie's top 4 app choices for healthy eating!